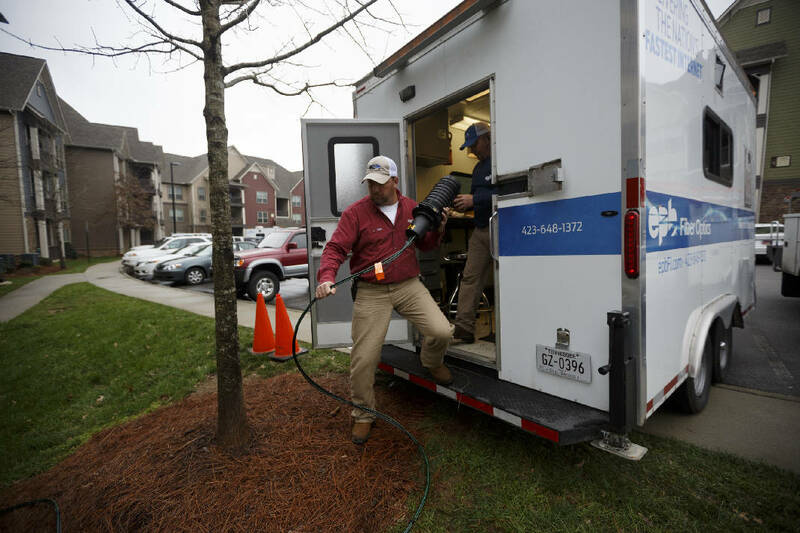 Service technicians Stacy Mann, left, and Nathen Lloyd step out of an EPB trailer with a newly installed fiber optics cable during a fiber optics installation at CityGreen Apartments on Friday, Jan. 15, 2016, in Chattanooga, Tenn.
Dr. Terry Forshee lives only a few miles from America's fastest broadband service. But when the Cleveland, Tenn., pharmacist needs a reliable Internet connection, he has to leave his south Bradley County home and drive to his pharmacy store in Cleveland. "I've been waiting for 27 years for Charter Spectrum, AT&T or somebody to come to me," said Forshee, who said the lack of residential broadband service is hurting his effort to build a national obesity education business. "I call every month, and I'm tired of waiting." Forshee and his neighbors are among thousands of rural residents in Southeast Tennessee who live near Chattanooga's fastest-in-the-nation Internet service offered by EPB but are still waiting for even basic broadband connections. Private telecommunication companies say it is too costly to serve sparsely populated areas of the state, and state law restricts EPB from expanding its telecommunications territory outside of where it supplies power to connect with those like Forshee. That could change this year if the Tennessee Legislature agrees to lift its territorial restriction on where city utilities may offer telecom services or a court upholds a decision last year by the Federal Communications Commission overturning Tennessee's limits on municipal broadband. EPB President Harold DePriest said the city-owned utility in Chattanooga is eager to offer its fiber-optic telecom services throughout Bradley County, if state law is changed to allow for such an expansion. But with a state legal challenge to the FCC still pending and ongoing studies on rural broadband being done by both legislative and executive agencies, legislative leaders warn not to count on such a change this year. "I don't see the Legislature doing a lot this year when we have two studies underway that we are paying for at the same time we have a court challenge to the FCC ruling," said Senate Pro Tempore Bo Watson, one of nine members of the Senate Commerce and Labor Committee that must approve any change. "We don't need to be in any rush to make a judgment." But backers of the change insist the state doesn't need more study to know there are gaps in broadband coverage in Tennessee preventing much of the state from sharing in distance education, telemedicine, telework and broadband-dependent businesses and entertainment. "We are thrilled that TACIR [the Tennessee Advisory Commission on Intergovernmental Relations] and ECD [the Department of Economic and Community Development] both have found our bill so incredibly important and of merit to study it, but we didn't ask for them to study it," said Rep. Kevin Brooks, R-Cleveland, a sponsor of the legislation to allow municipal broadband service throughout Tennessee. The debate over whether to allow the expansion of more municipal broadband has already reignited a century-old battle about the role of government utilities in what have previously been markets served by private business. Similar to the battle over public power that proceeded the creation of the Tennessee Valley Authority in 1933, private businesses are warning about unfair competition and undue taxpayer risks from cities expanding into telecommunications. Allan Hill, regional director for AT&T, said Ma Bell has been installing fiber-optic lines in parts of East Tennessee for more than a quarter century, and AT&T is now investing more than $20 billion a year around the globe on system upgrades. In Tennessee, Hill said, AT&T has averaged about $400 million a year over the past three years in investments in both its wired and wireless services, including about $4 million a year just in Bradley County. "We've got plenty of fiber in this area," Hill recently told members of the Cleveland/Bradley County Chamber of Commerce. "We can basically put fiber to a business pretty much anywhere within our footprint. It's just a matter of working with us ahead of time to know what is going on." AT&T will get $26 million from the $9 billion Connect America Fund to help extend service to rural and other underserved areas of Tennessee. That will help extend service in Tennessee to another 81,000 homes and businesses, Hill said. Century Link and Frontier telephone companies also are getting a portion of the federal universal fund collections to help expand their broadband service in rural areas. "We think there are ways we can work with state and local governments to cooperatively work together to get more broadband distribution," Hill said. If government-backed electric utilities are allowed to expand into broadband services, some private phone company officials worry that private investment will be crowded out. "No private investor is going to want to spend to compete against government," said David Snyder, president of RevTel, a competitive local exchange carrier that provides high-speed broadband service in downtown Dayton, Tenn. Government-owned utilities have taxpayer and ratepayer support and they don't pay corporate income taxes like investor-owned utilities. That gives city-owned utilities an unfair advantage over their private competitors and puts the public at risk in the event of a utility failure, Snyder said. Although it is owned by the city of Chattanooga and chartered as a non-profit corporation, EPB still pays a portion of its revenues to the municipalities and counties where it operates as tax equivalent payments. EPB is the largest single "taxpayer" in both the City of Chattanooga and Hamilton County through its tax equivalent payments, which are based on electric power sales and the value of EPB property and assets. EPB said its annual in-lieu-of-tax payments last year to 17 local governments totaled nearly $19.2 million. State Rep. Patsy Hazlewood, R-Signal Mountain, a former AT&T executive, said that while EPB has been successful, MGL&W in Memphis ended up losing $28 million in 2007 in its failed Networx venture. "All city-owned utilities are not created equally," Hazlewood said. "We need to be careful we don't put taxpayers and ratepayers at risk. Having said that, I certainly think it's time we found a way to serve the people in rural Hamilton and Bradley counties." State Sen. Janice Bowling, R-Tullahoma, the Senate sponsor of the measure to lift the limits on where cities may offer broadband service, said her measure is the best immediate way to serve those rural residents near any of the seven municipal broadband systems now operating in Tennessee. That includes those in Chattanooga and Tullahoma. "We can bring reliable, high-speed Internet to many more homes and businesses without any additional state dollars being spent and using only ratepayer dollars for the upgraded service," Bowling said. "This is free market at its best and cities providing a service the people want and will pay to support." DePriest said EPB "will only go where we are invited and where it makes economic sense." Although the Federal Communications Commission voted 3-2 last year to allow EPB to expand its municipal broadband despite Tennessee law, DePriest said he doesn't plan to invest EPB funds in such an expansion until the FCC decision is upheld in court or Tennessee lawmakers agree to alter their previous service limits on municipalities. Contrary to the losses in Memphis, DePriest said EPB's fiber optic system is generating a profit of more than $18 million which the utility uses to help hold down electricity costs and upgrade its broadband system to a 10-gig citywide network — the fastest communitywide Internet links in the Western Hemisphere. A study by UTC economics professor Bento Lobo estimates EPB's fiber-optics network has helped generate at least 2,800 more jobs and $865.3 million of additional economic activity in Chattanooga due to businesses that have moved here or expanded because of Chattanooga's faster Internet service. Chattanooga developer John "Thunder" Thornton, who is working to bring high-speed Internet service to his 3,000-acre Jasper Highlands development in Marion County, said broadband is critical today for delivering education, medical care and emergency services — and the lack of such service hurts the state's residential and business development. "How in the world do we expect our children to be kept up to speed educationally when we don't give them access to the speeds to keep up?" said Thornton, a former University of Tennessee trustee. Thornton questioned the latest online survey being done by the Department of Economic and Community Devlopment to assess the state's broadband service. "If you live in an area where you don't have the access to broadband service, how are you going to complete this online survey?" Thornton said. "It's almost comical, and I do think that these studies are a not-so-veiled attempt to delay any positive vote by the Legislature." But Randy Boyd, commissioner of the Department of Economic and Community Developement, said he is looking to develop a comprehensive plan to bring broadband to all areas of the state. Boyd said the study is important to define broadband service, measure where it is available and figure out how it can be expanded everywhere. The study, which is being conducted by Strategic Networks Groups and NEO Fiber, is expected to be completed in May. The General Assembly plans to adjourn this year in April. Boyd said he decided to conduct the study after a listening tour last year that began with widespread concerns about the lack of rural broadband coverage during his Chattanooga visit. "Tennessee's economic future is directly tied to our broadband access," Boyd said. "Our state is the most successful it has been in its history, but unfortunately, not everyone is sharing in its success, and the parts of our state that are not sharing in our success are primarily in our rural communities." Bowling and Brooks said their legislation could provide some immediate relief to some of those without broadband access while the state works on measures to serve all people. "Ours is not a total solution, but it is one solution," Bowling said. "We can't sit back and wait for the people of Tennessee to be ignored until we find some perfect government solution." But Boyd said the state is looking to find a better overall solution to expand high-speed broadband everywhere in Tennessee. "A solution for some, but not a solution for all, is not the way we want to go," he said. "We want to make sure when we come up with our solutions — and my guess is there will be multiple ways we need to address this concern — every county is included in that solution. I haven't seen a bill yet that provides that comprehensive of a solution." House Majority Leader Gerald McCormick, R-Chattanooga, who has previously sponsored measures to allow EPB to expand its service, said he expects "all of the parties to come to the table by next year and hopefully you'll see a solution then."